One of the main objectives outside of the political arena on Marine Vet For Freedom is to tell the stories of our nation’s finest men and women who go above and beyond the call of duty. I would like to proudly introduce you to Corporal Christian Brown, USMC, one of our nation’s heroes. 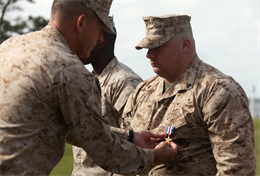 On Marine Corps Base Camp Lejeune, N.C. the Silver Star, the third highest medal for valor a service member can receive, was awarded to Corporal Christian Brown, a former squad leader with 1st Battalion, 6th Marine Regiment, 2nd Marine Division. He received the medal May 3, 2013. Brown, a Munford, Tenn., native, was awarded the Silver Star for his heroic actions while deployed to Afghanistan in support of Operation Enduring Freedom. He is the 42nd Marine to be awarded the Silver Star in Afghanistan. On December 7, 2011, Brown’s squad was attacked on a patrol. During the intense firefight, Cpl. Brown ordered two Marines to move to a different location in so they could gain the advantage against the attacking insurgents. During the two Marines’ movement, one was critically wounded in the head by insurgent fire. Brown instantly radioed in the medical evacuation and led his squad to the designated landing zone while taking heavy fire. The helicopter was unable to land due to the attacking insurgents, and Brown identified an alternate landing zone 400 meters away. He carried the injured Marine the final 300 meters while still under heavy fire. After assuring the Marine was safely evacuated, Brown and his squad returned to the firefight until fire ceased. He praised Brown for his constant motivation and leadership, including a story of when Brown inspected the commanding general’s gear before going on a patrol in Afghanistan. “It’s not surprising to me that when faced with extraordinary circumstances, he acted the way he did,” said Lukeman. Brown’s personal awards include the Purple Heart, Combat Action Ribbon, “General Kvinitaze” Georgian Achievement Medal and the Marine Corps Good Conduct Medal. He is currently with Wounded Warrior Battalion East, Marine Corps Detachment Walter Reed National Military Medical Center. Before the ceremony ended, Brown had a final message for the Marines in formation. This man is a true hero, and America is better off because of men like him. He is an example of the courage and fortitude that built this nation to where we are today. We must not forget the heroes like this. Men who risk it all to help a wounded comrade, and make America a safer place. We are a great nation for having such amazing men. We need to see more of these..and make it MUCH MORE PUBLIC!! Totally agree. I am going to be posting many more. If I hear of any sort of stories from our heroes, I will be posting them up here. I want their stories told, and I want them to be recognized for what they do every day for us. Far too often men like Cpl Brown do not get the credit they richly deserve. If the media is not going to do it, I will.